First of all, can I just say that I’ll be really excited when I have a computer that can run photo editing software? My netbook, Wilbur Robinson, is limping by on his last legs and it’s a miracle I can blog at all. In any case, I adored this month’s Ipsy bag. The theme was “beauty rocks,” and I’m pretty sure I could come up with a pretty decent rocker chick look from this collection. The bag itself was mildly underwhelming, but the record print is pretty cute. It just doesn’t seem terribly sturdy. I have a couple of travel sized Urban Decay pencils in the normal glide on formula, but I didn’t even know about this velvet variation. The Google tells me it’s new. It’s supposed to be matte and warm toned, and is meant for smokey eyes. I’ve been using it pretty regularly to tightline my eyes and it’s glorious! No smudges, and my lashline looks thick. Perfect. 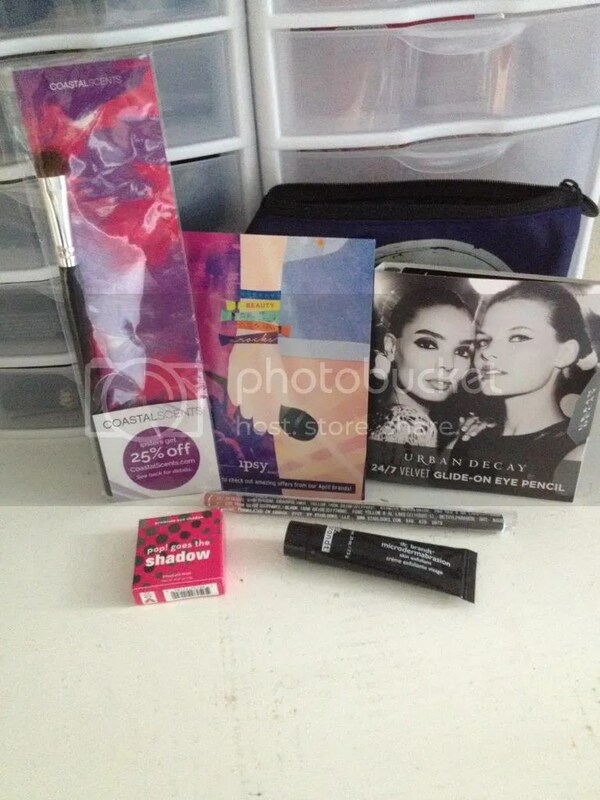 Plus, Urban Decay is one of my favorite brands, so thank you, Ipsy! This was another A+. You can never have too many shadow brushes, and this one is soft and doesn’t shed. I also got a 25% coupon code, but brushes aren’t a priority at the moment so I haven’t indulged. But I like the brush! This is a great scrub. The cleanser itself is creamy but not too thick, and the grit is super super fine. And it smells like lemons. At the same time, it feels more like a regular scrub than a deep microdermabrasion, but it’s nice. And no way is it worth $78. THIS IS A WIN. This is my new favorite shadow. It’s a warm rosy gold shade of champagne, and I’ve found it looks bright and brilliant all day long when I layer over my beloved Maybelline Color Tattoo in Barely Branded. And there’s no fallout. I have no clue about this brand at all, but this shadow is a new favorite. True confessions: I’ve never used a lip liner before. I just don’t see the need! This pencil is really creamy and really pigmented, though, so I found I could put this on and layer a gloss on top without it looking odd. Will I buy a new lip liner? I seriously doubt it. But I don’t mind this one at all. Sign up for your own Ipsy here!